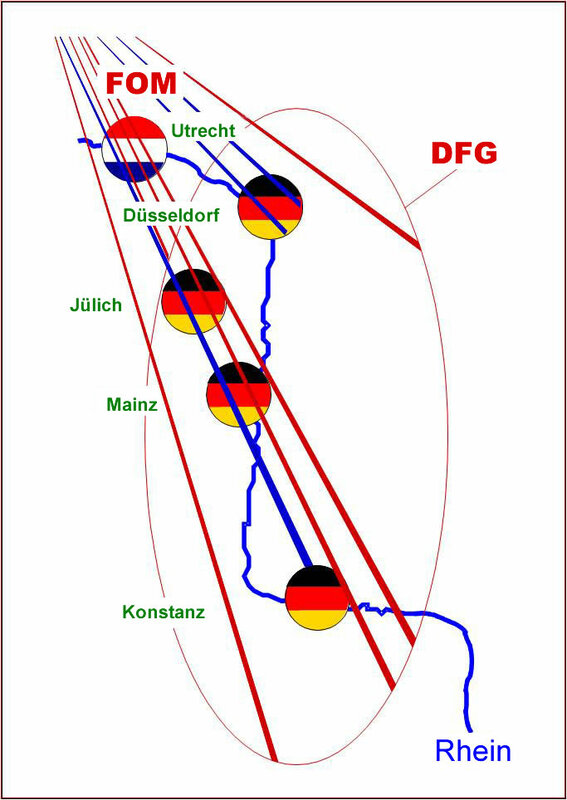 Basic concepts of the Transregio SFB TR6 "Physics of Colloidal Dispersions in External Fields"
The Transregio-Sonderforschungsbereich TR6 is focused on the rich physics of colloidal dispersions. The latter are solutions of mesoscopic solid particles with a stable (i.e. non-fluctuating) core embedded in a molecular fluid solvent. Among the various soft matter systems, colloidal dispersions play a prominent role as they can be both prepared and characterized in a controlled way. The effective interaction between the colloidal particles can be tailored by changing, e.g., the salt concentration in the solvent. 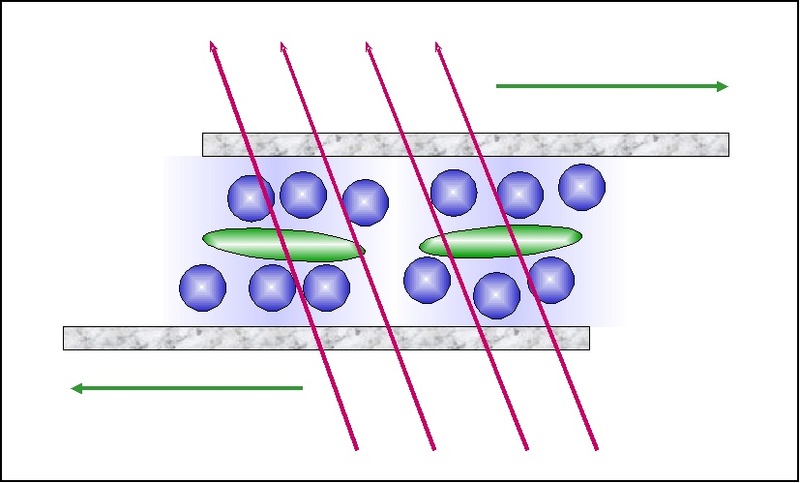 Moreover, colloidal suspensions can be regarded as the simplest prototype of soft matter: the length scale separation between the molecular solvent and the mesoscopic particles is unique and complete. Spherical particles without any additional structure on the mesoscopic length scale possess the simplest and highest possible symmetry. This directly implies that a simple theoretical modelling of a single particle without many fitting parameters is possible. Exciting questions concern collective many-body effects induced by cooperation and self-organization of many particles. A striking advantage of colloidal dispersions lies in the fact that these questions can be studied simultaneously by using three different complementary methods, namely experiment, computer simulation, and theory. 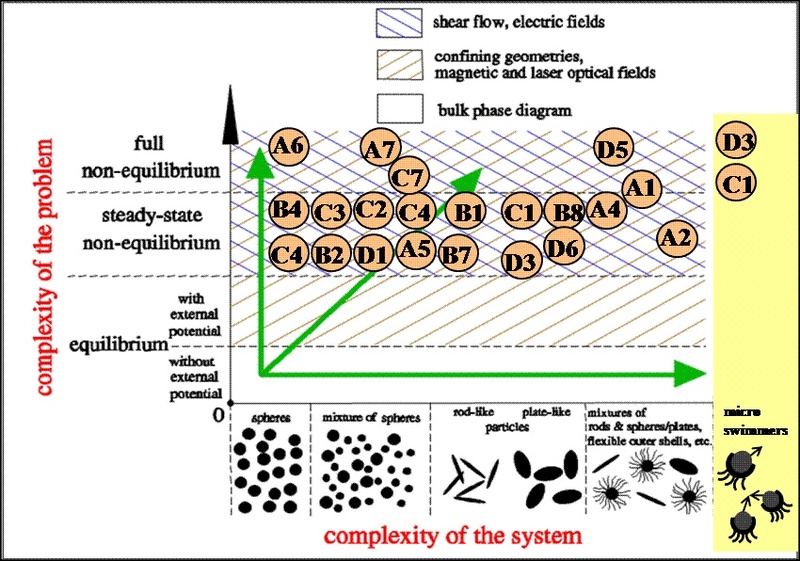 A profound theoretical understanding also provides an insight into the general basic principles and mechanisms of phase transformations such that colloids play an exposed role as model systems for condensed matter in general. We expect that colloids will play a similarly dominant role in exploring changes of soft matter properties in external fields which can be used to control the colloidal samples. This question is the central research topic in the Transregio-Sonderforschungsbereich. Bulk phase transitions of colloidal soft matter are meanwhile well-understood but important questions in confining geometries and additional external fields are still open. Such fields can be realized by a shear flow or by the presence of electric and magnetic as well as laser-optical fields and topographical fields such as confining geometry. The motivation to study an external control via external fields has two main reasons: i) First, by definition, soft matter reacts sensitively upon external perturbations and manipulations. The occurrence of stable colloidal bulk samples is the exception rather than the rule, i.e., one has to protect the sample carefully against shear and other perturbations. ii) The second reason is that strong external fields can induce qualitatively novel effects which are discovered and described within the Transregio-Sonderforschungsbereich TR6. 39 scientists from 5 locations (Konstanz, Mainz, Düsseldorf, FZ Jülich and Utrecht) are doing research together. Classification of complexity and main research routes followed during the duration of the Transregio-SFB. The main activity of the different project sections in the third funding period is also shown.